SimplyPure highest dosage 600 mg super Trans Resveratrol with Grape Seed extract and now enhanced with Bioperine. These highly absorable ultra pure Resveratrol Capsules are optimized for enhanced bio-availability with Bioperine for maximum absorption. Super Trans Resveratrol with Grape seed extract activates the Sirtuins and other signaling pathways which are associated with anti-aging. Super Resveratrol increases energy, Improves endurance, and helps with Longevity and protects against free-radicals. Grape seeds also contain proanthocyanidins (PCOs), which helps support Cardiovascular ailments. It also contains ultra high levels of Resveratrol with potent antioxidant properties to help fight cell damage which can lead to accelerated aging and numerous ailments. The chemical formation of resveratrol is extremely comparable to that of the synthetic estrogen agonist, diethylstilbestrol. Grape skins contain resveratrol, a type of plant estrogen, also called a phytoestrogen. In the human body resveratrol not only help fight aging, inflammation also removes wastes from our body and supports healthy blood flow, Grape skins also contains potent flavonoid which works as an antioxidant to support healthy cholesterol levels. Powerful blend of Trans Resveratrol with 3 advanced formulations, supports to Boost Energy Levels, Increase Metabolism and Improves Overall Health & Mind. Physician Natural products are manufactured in FDA, GMP facility using advanced manufacturing processes to preserve product stability and prevent oxidation during manufacturing and packaging. Every batch is tested by Internationally Recognized Testing Labs like Eurofins Scientific and COA enclosed with each order. The latest test report shows 514 mg of trans Resveratrol in each 600 mg capsule. This is our unprecedented quality guarantee and sets us apart from every other Resveratrol brand. As a dietary supplement, Take 1 capsule 1-2 times daily with food or as directed by a physician. We recommend you to buy resveratrol supplement that maximizes absorption and provides maximum anti aging and weight loss benefits. 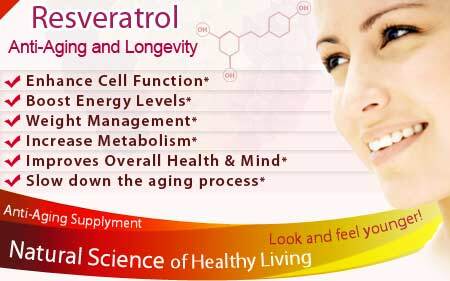 Super Trans resveratrol containing pure resveratrol capsules is the best choice from best anti aging supplements. SUGGESTED DOSAGE: As a dietary supplement, Take 1 capsule 1-2 times daily with food or as directed by a physician. DOES NOT CONTAIN sugar, gluten, milk, egg, shellfish or preservatives. caps® is a registered trademark of Capsugel.